This wonderful itinerary takes you over the Tram Tom, or Heaven's Gate Pass to explore the other side of Fansipan and the Hoang Lien Mountain Range. Often when Sa Pa is shrouded in cloud and fog, this side is clear and blue. 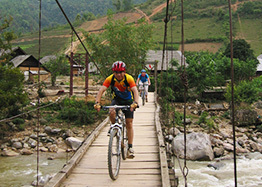 The newly paved road descends 26Kms through one of the most picturesque and inspiring valleys in the North where you'll glide down through the fresh mountain air to the Binh Lu Junction. Turning off this main road will add a moderate challenge to your adventure. The sometimes rocky road meanders along the base of the mountain range past old growth forest and through the villages of Thai, H'mong and Lu ethnic minorities. The area sees few tourists, so expect plenty of curious faces and smiling children shouting 'Hello!' as you stop to meet the locals along the way. Arrive Lao Cai station in the early morning, pick up and transfer to sapa, having breakfast before starting the trip. Firstly, your support vehicle will transfer you out to a starting point at the 'Silver Waterfall'. 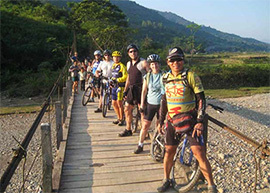 Then it's a 3km climb up the highest mountain pass in Indochina where you'll stop to marvel at the spectacular view of Hoang Lien mountains before free-wheeling down 26km to Binh Lu Junction. Heading off the main road, its 20kms of sometimes rocky road to Than Thuoc, a charming little tea town where you'll spend the night in a local guesthouse. 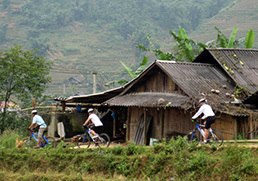 After a good breakfast, ride 40kms around the other side of the stunning Muong Kim valley with time for lots of stops to take pictures of the local hill tribe people and the stunning scenery there. Arrive in Van Ban for a late lunch then hop on the minivan to drive back to Lao Cai. Evening transfer to the station for a night train to Hanoi. Overnight on train.